With summer vacation in its first full week, Cam was anxious for activities. He and Amanda discovered the library was hosting an event called "Touch a Truck." The ad read: "Are you wild about trucks? Get up close! There will be an assortment of awesome trucks and vehicles on hand to explore, plus the pros who operate them. Decorate your own hard hat!" The pair explored every set of wheels there. The police car was a big hit as was the coast guard offering and dump truck. Not surprisingly, Cam said his favorite of the day was the school bus. Not one to be idle for too long, Amanda kept Cam on a schedule throughout their first full week together. With a chart to cross off activities, a calendar of events and "at home" golden tickets to earn things like lunch out on Fridays, our Amanda and Cam kept busy. Friday was our annual Adaptive Sailing Clinic in conjunction with Mary Free Bed. From MFB's website: Sailing is an inclusive sport with the potential to become a lifelong leisure activity that can be adjusted to one's interests. Opportunities for competitive pursuit or purely recreational enjoyment abound. This clinic provides participants with sailing techniques and the gentle finesse necessary to control the sails when heading into the open waters. Adaptive sailing has been a part of the Paralympic Games since 2000 and recognition of this sport as a serious athletic discipline continues to grow. This clinic is offered in partnership with Grand Rapids Yacht Club and Traverse Area Community Sailing. Cam wanted to be on time and we actually showed up early, ready to go before 9am. 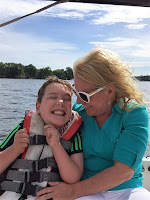 This was our son's 3rd time experiencing the thrill of sailing on Reed's Lake. As a bonus, the registered attendees and guests are offered a ride on a pontoon boat to tour around Reeds Lake. The ride was relaxing and the sunshine was starting to peek its way through the clouds. Immediately following the pontoon ride (and because Cam got us there early), we were up next for the sail. We boarded the "Rebel," a 16 ft sailboat rigged by Captain Rick. 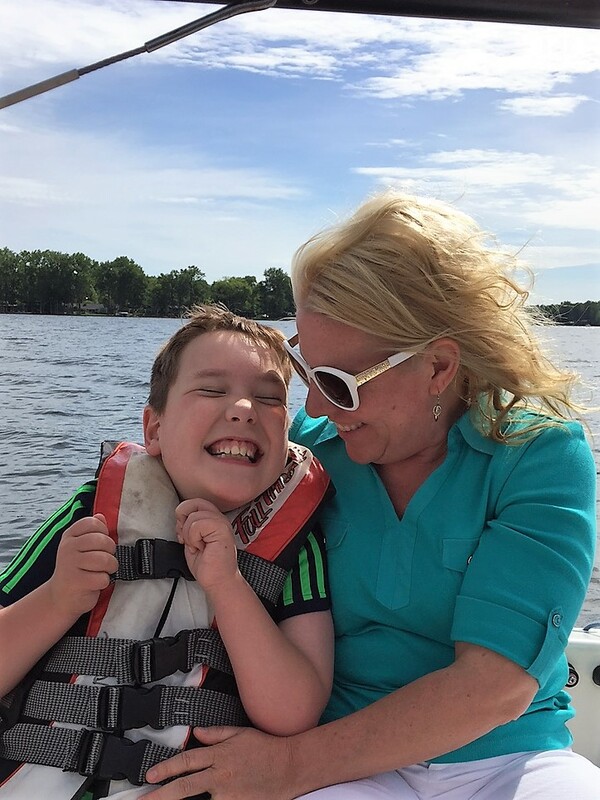 Not only did Jane, Amanda and Cam have a sailing lesson from the captain, but also heard about the rich history of Reeds Lake. The coordination and weather were perfect. As we set sail, the wind picked up and Captain Rick explained to us that the darker parts of water in the distance were actually wind gusts on the lake. The yarn tied to his mast allowed him to determine exactly which way the wind was blowing. Once back at the dock, it was noticeable that the ripples on the lake had subsided and we were convinced our timing couldn't have been better, thanks to Cam's punctuality. On Sunday, we celebrated this handsome guy who Cam sometimes refers to as Daddio and Superman, a very fitting description. Cam scripted the following, "Happy Father's Day, Dad. You are the best dad in the whole world!" After Chris opened the mug present from his son, he saw that it was filled with chocolate caramels and he was surprised. Cam said, "You deserve it, Dad!" Most definitely, and so much more. Cam often tries to determine what's happening the next day close to bedtime. This includes, but is not limited to, figuring out what he's going to have for breakfast. "Dad, guess what I want for breakfast? " "Dad, let me give you a clue. They are crunchy."